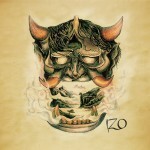 Also stylized as IZŌ with a long accent over the ‘o,’ Izo is the self-titled debut from Italian double-guitar instrumental four-piece Izo, who bookend four flowing and densely weighted progressions with an intro and outro to add to the atmospheric breadth. Rather than choose between heaviness or ambience, Izo – guitarists Paolo Barone and Maurizio Calò, bassist Francesco de Pascali and drummer Luca Greco – play both into each other so that a song like “Hikkomori” is as engaging in its heft as it is hypnotic. That might be easier to do without vocals, but it’s essential to Izo’s approach, and something that, for their debut, sets up future expansion of post-metal and psychedelic elements. I’m not sure if there’s a theme or narrative for the album, but consistent use of Japanese language and imagery ties the material together all the same, and Izo emerge from their first album having shown a clearheadedness of purpose that can only continue to serve them well.